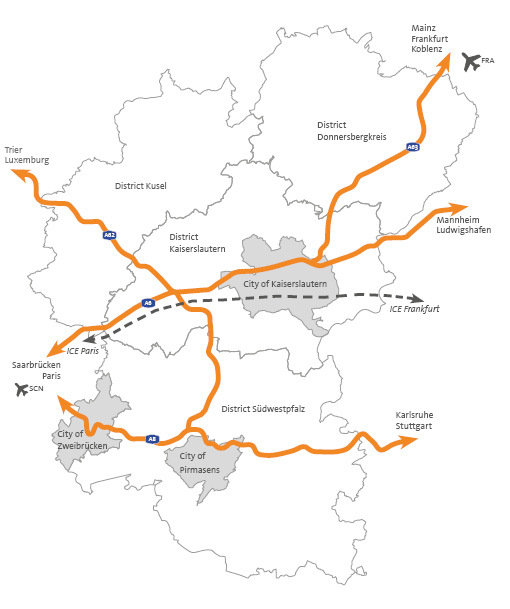 Commercial space in the West Palatinate combines the best transportation connection and top infrastructure with low prices. There's something for everyone, from small crafts workshops up to logistics providers. In previous years, numerous areas formerly used by the military have been transferred to civil use. It's a huge chance for the West Palatinate: business and technology parks with hundreds of new workplaces have been created in former base areas, but also civil fallow land. Even right now, many large development locations offer interesting possibilities for investors and businesses interested in operating here (see the overview). The local business development agencies will gladly help you with your plans to operate here or expand.